President-elect Donald Trump said hell nominate U.S. Representative Tom Price, one of the main architects of legislation to repeal and replace Obamacare, to be secretary of the Department of Health and Human Services. President-elect Donald Trump said he’ll nominate U.S. Representative Tom Price, one of the main architects of legislation to repeal and replace Obamacare, to be secretary of the Department of Health and Human Services, the first of multiple Cabinet announcements expected Tuesday. “He is exceptionally qualified to shepherd our commitment to repeal and replace Obamacare and bring affordable and accessible health care to every American,” Trump said in a statement. Trump also announced Seema Verma, founder of health policy consulting firm SVC Inc., as his pick for administrator of the Centers for Medicare and Medicaid Services. Verma has “extensive experience redesigning Medicaid programs,” Trump’s office said in the statement — including in Indiana, where she worked with Governor Mike Pence, now the vice president-elect. The two nominees are “the dream team that will transform our healthcare system for the benefit of all Americans,” Trump said. Another Cabinet announcement will be made this afternoon, Trump spokesman Jason Miller said on CNN. Price, 62, an orthopedic surgeon from Georgia, was one of the original House Tea Party caucus members and has served since 2015 as chairman of the House Budget Committee, where he was a leader of efforts dismantle the health law, also known as the Affordable Care Act. Trump said during the campaign that he wants to get rid of the law. 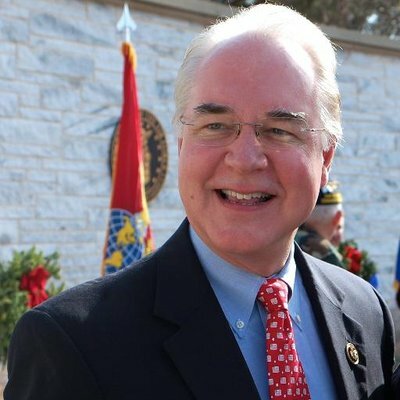 “There is much work to be done to ensure we have a health care system that works for patients, families, and doctors; that leads the world in the cure and prevention of illness; and that is based on sensible rules to protect the well-being of the country while embracing its innovative spirit,” Price said in a statement. If Price is confirmed for the HHS job by the Republican-controlled Senate, his departure from Congress would cap a congressional career that began in 2005 after his election by an Atlanta-area House district. Price had served previously as a state lawmaker, rising to become Senate majority leader. Price grew up in Michigan and graduated from the University of Michigan and its medical school. He worked for almost 20 years as a surgeon. His wife, Betty Price, was elected to the Georgia House of Representatives in July 2015. Price was chairman of the Republican Study Committee, a caucus of the most conservative members in the U.S. House, in 2009 and 2010. In May 2015, he proposed a bill to replace Obamacare that focused on tax credits, expanding health savings accounts and revising laws governing medical malpractice. “Congressman Price has proven to be far out of the mainstream of what Americans want when it comes to Medicare, the Affordable Care Act, and Planned Parenthood,” Schumer said. Trump’s nominees likely will have to manage an overhaul of Medicare, the health-care system for the elderly and disabled, that’s planned by Republican lawmakers. House Speaker Paul Ryan, a Wisconsin Republican, has proposed to privatize Medicare and provide seniors with vouchers to help cover health-insurance premiums. Price said Nov. 17 that Republicans plan to use a procedural measure known as reconciliation to make the changes to Medicare in 2017. Price is a member of the Doctors Caucus, which recently has raised concern over a proposal from the Centers for Medicare and Medicaid Services for a new payment system for physicians. The group said the system has the potential to “overcomplicate an already burdensome and complex” system. In early 2011, the House Ethics Committee announced it had dropped an investigation of Price and two other lawmakers into their fundraising appeals to Wall Street firms at the same time they were considering legislation to overhaul financial regulation. Verma was the “architect” of Pence’s “signature health-care plan” who “quietly shaped much of Indiana’s public health-care policy” for more than a decade, according to a 2014 report by the Indianapolis-based IndyStar on concerns about potential conflicts of interest in her consulting work with a division of Hewlett-Packard Enterprises Co., one of Indiana’s largest Medicaid vendors. Verma said she had no role in HP’s state contracts, according to that report, and a Pence spokeswoman said Verma’s “advice and counsel” was appreciated. She received a master’s degree in public health with a concentration in health policy and management from Johns Hopkins University and a bachelor’s degree in life sciences from the University of Maryland, according to the announcement.